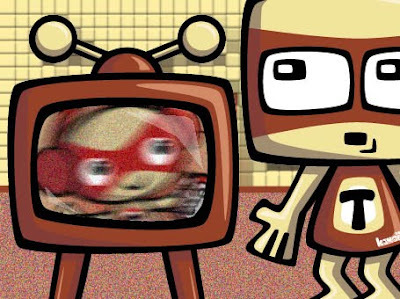 KawaiiPunk - Kawaii Mascot Blog: Telly Trouble! TV Mascot! Hmmm! It looks like our old friend the TV Mascot has been sent a DVD message from one of his colleagues - don’t ask why, just go with it! But unfortunately his television set is acting up and he can’t work out who sent him the message! Oh the irony! Looks like a touch of retuning is in order. But the question is… can you work out which mascot sent TV the DVD message? The answer, as ever, will be revealed in this month’s monthly round-up!